I always loved rummage sales. Besides the bargains I could score, I relished sifting through the discards of strangers’ lives. Since I was a child, I enjoyed going on these treasure hunts with my mom and siblings. Then when my kids were young, I continued the tradition. In addition to the fun, it taught them the value of a dollar. So when my neighborhood church, St. Francis of Assisi, asked for volunteers to work their rummage sale event, I jumped at the chance. On that balmy October Saturday morning, I hobbled along the three blocks to the gymnasium right next to St. Francis Church. I hobbled because the sidewalks in uptown New Orleans are as uneven as the parallel bars in the Olympics and because the arthritis in my left knee was flaring up. The man in charge assigned me to two tables that were filled with a hodgepodge of knickknacks. The items didn’t fit into the other neatly defined categories: clothing, books, DVDs, jewelry, pottery, dishes, and Christmas decorations. All kind of little treasures populated my tables. I set my paisley tote bag against the wall behind me and started studying the items, getting familiar with the goods. A couple of vintage piggy banks caught my eye. My kids used to love depositing their nickels, dimes and quarters into their little banks. I next checked out a set of crystal keepsake boxes, a vanity set, and an earring tree. They all seemed to go together. Probably the same lady donated her old dresser top items. I didn’t quite finish inspection of my tables when the doors opened. People rushed inside like you see on old appliance sale commercials. I grinned when I pictured myself doing the same thing if I weren’t working the event. When a group of customers clustered at my tables, I started chatting with them like we do in New Orleans. Where did they go to high school? Did they check out the new po-boy eatery on Prytania Street? Do they think the Saints will get it together this year? Most of my folks wandered over to the raffle ticket table, but the young couple stayed put. The lady picked up a pair of ceramic bluebird salt and pepper shakers and a set of Russian nesting dolls. “There. I think I’ve made my selections,” she told me in a clipped tone. Her face fell and her lip curled slightly, so I figured I had insulted her. They must have paid a bundle for that pin. When I picked up the Russian nesting dolls, my fingers briefly caressed the painted wood face and body that looked like a milkmaid. I started to wrap it, but my fingers continued to clutch it. Chills made their way down my spine and spread throughout my whole body. That’s when I knew: I couldn’t sell this item to them. I didn’t know why yet; I just knew I couldn’t. Ah, he speaks, I thought to myself. “I meant to set them aside for a sweet little old lady, but the crowds came, and I got distracted. So sorry.” While I consider myself honest to a fault, I can bluff with the best of them when my gut instinct commands me to. “I really like it, too,” the woman pouted. I didn’t feel like dealing with this, and I almost released the dolls, but these vibes don’t come to me for nothing. I get them sporadically and they always mean something. “Let’s just go,” she huffed, and they walked away. Since I had lied to her, and the church had missed potential sales, I went ahead and paid for the salt and pepper shakers, and of course my Russian nesting dolls. I needed to keep them until I could figure out why. After I got home, I settled in my comfy plaid recliner chair in the living room with a cup of coffee, two lemon cookies, and the nesting dolls. My poodle mix rescue curled up in my lap. I stroked her soft fur and examined the dolls. The intricate detail of the painting of the young milkmaid impressed me. I could clearly see all the features, her expression, and the pail she carried. I’d never owned or handled this kind of doll, but I knew the point was to open them up, and a smaller replica was supposed to be inside. So I pulled it open. My spine tingled with anticipation. All it revealed was an even smaller milkmaid. Before I could open the next one, the phone rang. After I told the pesky telemarketer I was not interested in any new phone plans, I popped open the other milkmaid. When I turned it upside down, I saw a piece of notebook paper jammed inside. Chills raced up and down my arms and legs. I unfolded the worn piece of paper. Scrawled in what looked like a child’s print was a message: “I need help. I’m in Levee Trace with—” That was it. It’s like the kid got interrupted and jammed the note in the doll. I studied the note over and over. The scrawling looked like it came from a left-hander to me. My son is left-handed, and I remember the sweet notes he used to print for me when he was a little boy. I played possible scenarios through my mind. A child was being abused, maybe kept captive, and managed to cry for help through this nesting doll. Levee Trace. That had to be the Levee Trace subdivision that ran along the Mississippi River in a suburb about ten miles from where I lived. My daughter and her family lived near there. Nothing could keep me from going out there and searching every nook and cranny of that neighborhood to find answers. A child might be endangered after all. While I didn’t have a whole lot to go on, I hoped my sixth sense would make up for that. I lay awake that night in my bed concocting my plan. Once these vibes hit me, I can’t sit around and wait for answers to land right inside my head. I’d go visit my daughter Claudia, like I often did on Sundays anyway. My grandkids loved when their M’Tilly came over. They filled my whole heart up and then some, that’s for sure. While there, I’d put on my walking shoes and go deliver Avon books to every doorway in Levee Trace. Being the friendly, outgoing New Orleanian that I am, if people happened to be out, I could start up a conversation. See, my rummaging didn’t stop at school benefits, church fundraisers, or garage sales. I found myself rummaging around in people’s minds and backgrounds if I sensed I had to. When that feeling or vibe overtook me, I turned over every item and sifted through every rack to mine that sensation. Sunday brought a hint of that elusive autumn weather that folks in other geographical areas take for granted. The crisp breeze energized me as I walked to the bus stop. I refused my daughter’s offer to pile her five-year old twins into her Buick and drive uptown to pick me up, only to have to tote me back that evening. My son-in-law often just showed up before I had a chance to catch the bus, but he was out of town on business. Why should I inconvenience them? I chose to live without a car. It made no sense to spend money on the upkeep when I could easily get around on public transportation. I liked it. I’m a people watcher, and I cherish the encounters I’ve had with fellow riders. After enjoying a lasagna dinner my daughter made from my old recipe, my grandkids and I made cookies. In their precious little heads, I think they automatically associated me with homemade goods. How could I disappoint them? There’s a special joy, anyway, in creating something in the kitchen with loved ones. When the baking was done, Clara and Clay got busy playing in the den, and my daughter and I sat in the kitchen, drinking coffee and watching them. “I’m going to take a walk in a few minutes,” I told her. “Mom, I’ll take you anywhere you want to go,” she protested. “I’m going to every door in Levee Trace,” I countered. “It will take a long time. Besides, it’s a beautiful day, and I need the exercise.” I picked up my paisley tote bag stuffed with Avon books. The Russian nesting dolls lay on top. I wasn’t sure whether to bring them or not, but something told me to have them handy. “Can you keep these safe while I go deliver books?” I asked her. I caressed them in my hands one more time. “I didn’t raise any fools, that’s for sure.” I told her the story and opened the dolls to show her the note. Claudia covered a chuckle. I loved the way she did that, ever since she was a little girl. She slightly bit her lip and closed her mouth tight. Her big brown eyes shined with merriment. I let her touch the doll. “I know,” the child said, as she studied the painted milkmaid and rubbed the wooden doll. “So pretty,” she said. “Sure, but you have to walk kind of slow. M’Tilly can’t be chasing after you. I’m too arthritic,” I told her. Clay preferred to stay home and play with his trains. Claudia set the nesting dolls high up on the étagère in the living room, and Clara and I set off, Avon books weighing down my tote. Levee Trace Subdivision began one street over from my daughter’s. I held Clara’s hand as we walked. I started sticking Avon books in each doorway. The whole neighborhood was dead as a doornail. A beautiful fall day, and people were seeking pleasure indoors or in their cars headed to some destination for fun and relaxation. I think Dorothy from The Wizard of Oz was right. Why not look for their heart’s desire in their backyards? We crossed to the next street. Lots of sycamore and pecan trees shaded this particular neighborhood. A couple of young moms sat outside minding their little ones. Clara skipped right up to them to make fast friends. I asked the moms if they would like an Avon book. They graciously took one each and started talking about skin care products. I kind of listened, but I really watched the children. They were playing with plastic pails and shovels in the garden area. One of the little girls was left-handed. “Oh, my God, look at these sandals, Janey,” one of the moms said to the other. She liked the red Gladiator sandals featured in the catalog. “Those are hot,” answered Janey. I stood there praying they would order so I could snag my excuse to come back, as this mission could take more than one or two visits. The left-handed girl patted her pail down and scooped dirt into her hands. Then she spread it in the pail again. She dwelled in her own little stratosphere, not mixing with the other kids. Still, I honestly couldn’t say I got that feeling that anything was amiss. I warned myself about jumping to conclusions too quickly. I thanked them and called for Clara. We continued placing books in the doors. I hobbled through the rest of the winding streets that made up Levee Trace, keeping my eyes and ears on high alert for any sights or sounds that may clue me into a possible child in distress. Clara skipped ahead of me, checking out rocks and bugs, waving to anyone who happened to be out. I saw a dad teaching his little boy how to bat a baseball. As Clara stayed engrossed by a crevice in the sidewalk filled with doodlebugs, the boy started whining about wanting to go inside. The dad marched over to him and banged his fist on the child’s bump cap. This made the little boy cry more. Could this boy be my nesting doll victim? He batted right-handed, but I didn’t know for sure the writer of the note was left-handed. The child’s mother came outside with lemonade, and the little boy cheered up. I gave the bully dad a look that I hoped communicated, “I’ll be watching you,” and Clara and I walked back to my daughter’s house. I was pooped out. I even accepted Claudia’s offer of a ride home. When the gladiator sandals came in for the two young moms, I made plans to make my delivery and walk the neighborhood again armed with new Avon catalogs. Sometimes it took a lot of snooping to get the answers this infuriating sixth sense demanded of me. On Saturday morning, I finished off a cup of coffee before I set out to the bus stop. I looked forward to seeing Claudia, Clara and Clay again. Sometimes mixing things up a bit is a good idea. Saturdays may bring more people out and about, or at least different folks to possibly observe or engage with. Clara had a ball going around with me last Sunday, and I wondered if she’d want to come again. My mind drifted to her urging me to approach the houses via the levee. That tingling sensation took hold of me. 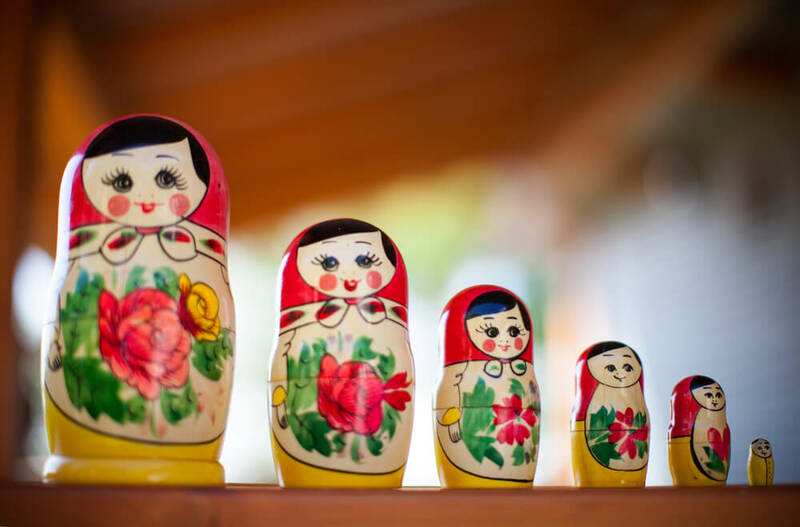 I pictured the way she caressed the Russian nesting dolls, and the way she said, “but you can see the backs of houses that way.” Why would a five-year-old know or care about seeing the backs of houses? The cup shook in my hand. Did Clara possess this gift, this burden, this deep yet random sense that surfaced with no notice and could completely overtake your every waking thought and even some dreams? I walked to the sink to rinse my cup. My great aunt, my Na’Nan, I called her, had it. Did I pass this along to my little Clara? Was it a bad thing? A good thing? It could bring about justice, prevent further menace, but it could also pose serious dilemmas. Before I jumped to any conclusion, I would go about my plan and see if Clara even wanted to accompany me. In case she did, I wrapped my arthritic knee with enough bandage to mummify a small child, and I popped an Aleve. If that precious child wanted me to climb the levee to see the backs of houses, I’d be damned if my knee was going to stop me. “Are we going to bring Avon books again, M’Tilly?” asked Clara as I embraced her and Clay in a bear hug. Maybe she just liked running around in Levee Trace, I told myself. This innocent five-year-old deserved carefree days that presented natural wonders to a child. I didn’t want her burdened with solving intangible dilemmas that screamed from her psyche. After visiting for a while, Clara and I set out on our mission. “How’s your knee, M’Tilly?” She looked up at me with such earnest brown eyes as I held her hand and walked across the street. It turned out the young moms were super nice people. The one with the left-handed child invited me in, and then called the other over so I could give them their cherished shoes together. The left-handed little girl was more animated today, dancing around to a Disney video. She shrieked with laughter and seemed to be a perfectly happy child. “Do either of you all know the family that lives in the white brick house near the highway?” I asked, alluding to the brutal baseball dad’s house. “Yes, just to wave and that,” said one mom. “My older son plays with their son,” said the other. I told them about what I had observed. My vibes hadn’t telegraphed anything to me about the baseball kid. I was just an observer on that one, and my focus had to stay on the plea for help concealed inside the Russian nesting dolls. When we parted, Clara took hold of my hand and led me south toward the Mississippi River levee. I tottered up the levee as she held my hand. “I won’t let you fall M’Tilly, I promise,” she said sweetly. When we reached the top, we stopped and gazed through the thicket of trees and grass at the mighty river. A lone egret purposely stepped through the muddy marsh with its seemingly out of proportion long, matchstick legs, hunting and pecking. “That bird means business,” I said to Clara. We ambled along the paved levee top. I followed Clara’s lead. She stopped and faced the fenced backyard of a modest buff-colored brick ranch style home. The yard butted up against the foot of the levee, and a cleared sandy path led to the gate. Clara squeezed my hand and pointed. “My friend lives there,” she whispered. Almost on cue, we saw the back patio door of the house open. A tall, broad-boned woman wheeled an elderly lady out onto the patio. “There she is! That’s Miss Melba!” Clara jumped up and down. I watched her caregiver slip back inside and return with a canned drink that she plopped on the wrought iron patio table. She disappeared inside again. Miss Melba held her hand up and waved at Clara. “Okay!” She frolicked down the levee like only a child can. I stood on the levee, leaning against a signpost that warned against littering, and enjoyed the October breeze blowing from the river. While I couldn’t get a good look at Miss Melba because of the distance, I detected a big smile cross her face when my Clara skipped up to her. My heart warmed over at the joy they both gave each other. Then I noticed Miss Melba hugged Clara and pulled her closer with her left arm. I noticed she held her Coke can in her left hand. But it wasn’t just the fact that she appeared to be left-handed. That sensation overcame me. As sure as the river flowed behind me, I knew I had found the writer of the Russian nesting doll note, and my Clara had led me to her. My precious Clara knew! She didn’t know what she knew, but she knew. Clara shook her head slowly. She placed two fingers over her mouth. When we walked to Miss Melba’s house the next day around noon, I had no idea how all of this would play out, but we both plodded forward on our mission. I brought the Russian nesting dolls with me. Sure enough, Miss Melba was sitting in her wheelchair under the covered awning. Clara raced down the path and opened the gate. She waited for me and took my hand when I reached her. As I hobbled through the leaf-strewn high grass of the backyard, I studied Miss Melba’s face. Her wrinkled, tired, distressed face changed as we got closer. When she glanced at what I carried in my hand, a glimmer of something seeped into her eyes as her whole demeanor slightly shifted. I saw hope. She stuck out her left hand, and we shook. “Call me Melba.” From the way she spoke and moved, I could tell she had suffered a stroke. Her whole right side was slightly distorted, and her speech was strained and slurred. She wore a tattered, yellow robe over a purple polyester nightgown. I smelled urine when I got close to her. “You live here with your daughter?” I asked. She nodded. “Patrice and Ned.” She spoke Ned’s name through gritted teeth. “Sure.” Clara hopped up and skipped through the gate and on the levee where we could watch her. She immersed herself in finding a lucky clover. My heart broke as she described what amounted to her imprisonment. After she had her stroke, Patrice and Ned came to the supposed rescue and took her into their home. Her son, who lived out of state, had no idea about her reality. Patrice and Ned had taken total control of her finances. The only place she ever went was the doctor’s. Sitting outside in the backyard was the sole diversion she had from the dreary room she lived in most of the time. They never even took her out in the front yard. That risked engagement with neighbors, I figured. They monitored her phone calls so when her son called they heard everything. Even if she tried to complain, Ned and Patrice convinced him she was angry about this or that or just plain ungrateful. Their control would not be complete without rendering her penniless. She had to beg for a new gown or her favorite lotions, and they usually told her they couldn’t afford it. All of her money went to room, board, and her medical bills. They had even sold her house and kept that money as well. “Frank Delatte. He lives in Atlanta.” She recited his phone number and I committed it to memory. Before she could continue, the patio door slid open. “What’s going on, Mama?” The tall woman walked up to me. “Hi, I’m Patrice.” She put on a cheerful smile. “If you’ll excuse us,” said Patrice. Without another word, she stood behind the wheelchair and started rolling Melba in. I’m a pretty good actress, so I just casually told them goodbye. Patrice roughly hoisted the wheelchair over the doorstep. I caught one more glimpse of Melba as she waved, and I saw the worry in her eyes. Along with arthritis, my mature age gave me some useful tools. One of those tools was becoming quite adept at the art of convincing. As soon as I got home, I called up Frank Delatte. When I reached him and told him the story, he fell silent at first. I knew he was mentally processing everything I had told him. If I were guessing, I figured it all made sense now in hindsight. He probably recalled times his mother whispered complaints over the phone, and her captors blew it off. “I’ll take a flight out tomorrow,” he said. My heart filled up with gratitude. A week later, Clara and I walked down Levee Trace Drive. “Can I carry the basket, M’Tilly?” she asked. “You sure can.” I handed her the basket chockfull of lotions, creams, bath bubble and moisturizers. We saw the white Ford Escape parked in front of Miss Melba’s former prison house. Frank Delatte had called to tell me when he planned to move her out. It took a lot of wrangling and jumping through hoops, but he came through. He played it smart and acted like he came in for a surprise visit. It surprised Ned and Patrice, all right. Heh, heh. Comeuppance can be a grand, beautiful thing. As we walked up, Frank wheeled Miss Melba out. Clara ran up to her friend, basket in hand. Miss Melba hugged the child and took the basket of beauty goodies. Clara then followed them both to the vehicle. No sign of Ned and Patrice, although I knew they were watching from some vantage point in the house and were probably figuring it all out. After Frank got Melba seated in the car, I walked over to the car. The elderly woman grasped my hand in both of hers and looked me straight in the eye with soul-piercing gratitude. “Thank you,” she whispered. I gave her a hug and moved aside so Clara could say goodbye. She would take some time to heal, but I think Miss Melba had some good years ahead of her. She raised her left hand and waved to us as they drove off. Drove off to freedom. Before Clara and I set out back to her house, she clasped my hand. She looked up at me and I looked down at her. We didn’t say any words. We didn’t need to. Piper Templeton’s first book, Rain Clouds and Waterfalls was published on Kindle in May 2014. She followed it up with a women's fiction/mystery set in New Orleans, Beneath the Shady Tree. Piper volunteers for a reading program for second graders, hoping to instill a love of reading in them. Her second novel Beneath the Shady Tree is available on both Kindle and print. Read more articles by Piper Templeton. All original work attributed to Piper Templeton © 2017 Piper Templeton.